One of the perks of working at Tuvalu is meeting all the interesting people who visit from all over the world. We get asked many times a day things like, Where’s the best place for a romantic dinner? Who has the best quick taco lunch? or Where can I get a really good latte? There are the obvious places to refer people to but sometimes it’s a hidden hideaway they’re looking for. We could talk for hours about our favorite spots in Laguna but we decided to ask each employee which was their #1 favorite and we’ll share the secret with you! Let us know if we left one out… your secret’s safe with us! With its funky decor and a cozy atmosphere, this hidden hideaway has been here for nearly 20 years. The cuisine is described as ‘eclectic California fare,’ and they have been praised for their fresh and unique seafood dinners. Share a few plates between friends (we love the swordfish) as the portions are large! A true beach hut lunch place off Pacific Coast Highway, a short walk south of downtown Laguna. With wave paintings on all four walls and surf boards hung in the rafters, this is our go-to for a great sandwich. Allison loves their tuna sandwiches and their bee pollen smoothies. Their food is healthy, reasonably priced and you can’t beat the location. Another local tip: Grab a burrito and a coffee to-go and walk 50 steps west for breakfast on the sand at Cleo Street. We grab lunch here a lot since it’s just down the street from Tuvalu. But we’d walk several blocks if we had to, just to get one of their fish tacos or their blackened salmon salad. Order at the counter and sit in the sun on Mermaid street. If you’re here for breakfast try the burrito with carne asada and you’ll be smiling all day! 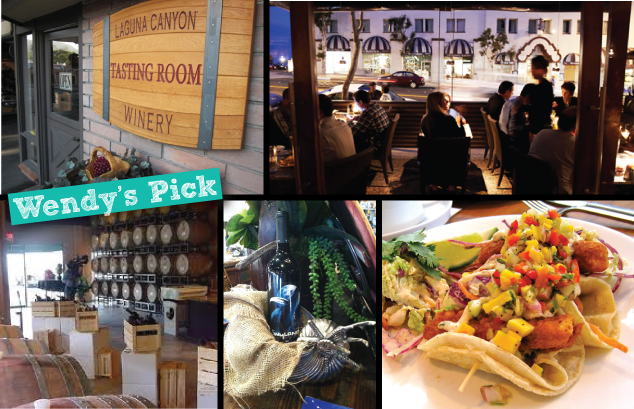 Here’s one you probably haven’t tried… Laguna Canyon Tasting Room is right in downtown and they offer complimentary tastings with the purchase of a bottle of wine. But wait there’s more. After you enjoy your tastings, take your bottle (we love a bottle from the Wyland Cellars collection) over to Nick’s for dinner. Enjoy their $0 corkage fee with your Wyland wine and make sure to get the fried asparagus – nom, nom, nom! We have two Starbucks in downtown Laguna alone. But somehow they both stay busy, even with Zinc Cafe right down the street. Locals line up first thing in the morning here on their way to work. If you have a minute or two, order a latte “for here” and sit on their parisian-inspired, ivy covered patio. The latte arrives in an oversized ceramic mug, brimming with foam. Try the fruit bowl and you’ll be amazed at the brightest berries with a hint orange zest and honey. Or a fresh cranberry-orange scone with homemade butter and jam. We couldn’t think of a better way to start our day! Another local tip: in the summers, order dinner on their patio and enjoy live jazz music while you dine. 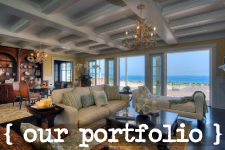 Great blog…… love every place you mentioned!!!!! This is fantastic. 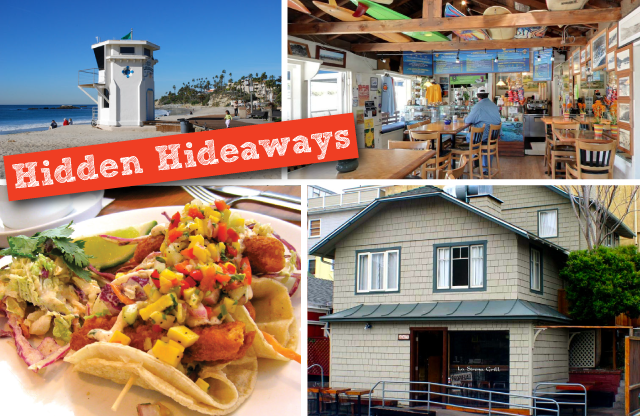 I thoroughly enjoyed reading today’s post about laguna’s favorite hidden hideaways! I am excited to try a few of your favorites soon.